Fortunately, Relay has all these things covered! Make 2019 the year you get a smarter filter with the most powerful, time-saving features. Thanks to the growth of 1:1 programs and take-home device policies, many schools manage multiple filtering solutions. That’s a waste of time if you can get end-to-end filtering with Relay. Relay covers every device and OS, wherever those devices go (on and off your network) — including BYOD and IoT traffic. And you can do it all without any hardware on your network. About 40% of schools say they block YouTube for students because they can’t give students safe access. Google services, blogging platforms, and social media channels present similar filtering issues. With Relay, all this is easy. Smart Play lets you turn on millions of safe, educational YouTube videos in just a click. Relay’s other features make all the best educational sites — including those that are dynamic and ordinarily difficult to filter — safe. When we recently polled IT directors, they all said they need better insight into SSL traffic — for instance, reporting on search terms — but 36% of those respondents getting those insights with SSL decryption was too much hassle. That sentiment was shared by the 48% of respondents who said they’re decrypting despite the hassles. In the past, decrypting SSL traffic has meant setting up a TMITM proxy, creating PAC files, and managing trust certificates. No more! Relay’s patent-pending Smart Agents make SSL decryption easy. They self-manage the entire decryption process so you get the granular policy controls and reports you need without having to do a thing. We know what often happens when a parent hears about — or sees — a student accessing inappropriate content on a school device: They call the local news. Next thing you know you’re managing a PR crisis. Lightspeed Systems has been filtering for schools for 20 years. Relay has the most comprehensive database and categorization system, as well as the most powerful scanning technology, in the industry. With Relay, you can be confident that your students are safe and your school is CIPA-compliant. You have a lot to do; you know you need to delegate. Easier said than done! The hard thing about delegating is making sure nothing is done incorrectly, no settings are inadvertently changed, and nobody gets access to the wrong information. With Relay’s Admin Roles, you can easily delegate appropriate access to the appropriate people for designated schools and classes. For instance, you can empower a school-site tech to access specific settings for their school only, or give a principal read-only access to key reports at their school site. You need very detailed student activity information, but that level of granularity shouldn’t come at the expense of high-level overviews and scannable, actionable reports. Relay gives you both. Its dashboards allow you to keep an eye on everything and drill down for more detailed information. Individual student reports, parent reports, internet overview dashboards, YouTube reports, search reports, safety reports — they’re all built into Relay. No school can ignore the need to adhere to best practices as well as federal, state, and local guidelines for managing student data. Lightspeed Systems takes student data privacy seriously; all our solutions are GDPR-compliant, FERPA-compliant, and in accordance with every state mandate. Additionally, Lightspeed was among the first tech companies to sign the Student Privacy Pledge. More than half of students report being cyberbullied. Cyberbullying makes a student nine times more likely to consider suicide — which is the second leading cause of death of young people aged 10 to 18. At Lightspeed, we’re passionate about working with schools to change those statistics. Most students who consider or attempt suicide (or other forms of violence) give clear signs. Relay’s Safety Check uses advanced AI to analyze student search terms, web visits, social media activity, Google/O365 docs, and more to alert administrations of potential student safety risks, allowing school staff to intervene and prevent violence. Managing your 1:1 is about way more than filtering. You need to manage apps, deal with classroom management, control device policies, and more. 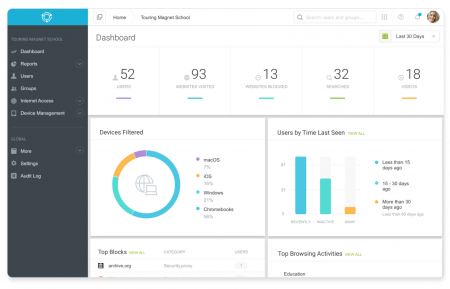 Relay is a complete 1:1 platform that brings together filtering, device management, classroom management, and safety in one time-saving platform. Check out our recent “New Year, New Filter” webinar with Joe Kuzo, director of information technology at Quakertown Community School District, to learn more about why schools all around the world choose Relay. We’d love to help you get a better filter in 2019. Ask us how you can save time filtering while getting more information, more safety, and more control.